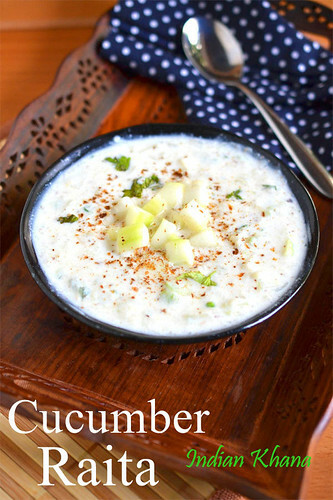 We can make cucumber or kheera raita with either grated or chopped cucumber as we like here I used both grated and chopped cucumber to have crunchiness plus to make the raita thick with full of cucumber flavors, you can follow this method or just use grated/chopped cucumber whatever you like. Also if not making this raita during fasting you can sprinkle little of red chili powder on top too to make it look more colorful or even we can add freshly crushed pepper instead of green chilies. 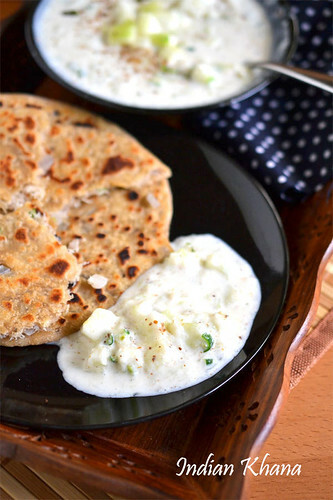 Raita goes well with any paratha, variety rice, biryani etc and it's most of the time takes very less time to prepare too. 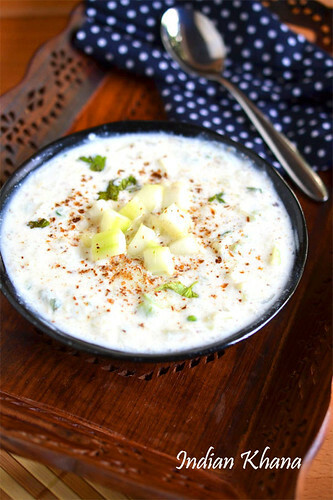 Specially during hot summer a simple raita as this cucumber one can be so much of relief, we can have a large bowl full of raita as a snack or light lunch too if preferred. 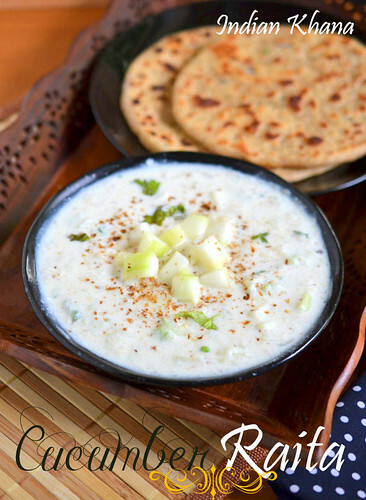 You can make this raita during fasting or upvas too and serve it with sabudana thalipeeth, sabudana khichdi, singara poori, singhara cheela etc. You can also check other fasting or vrat recipes here. 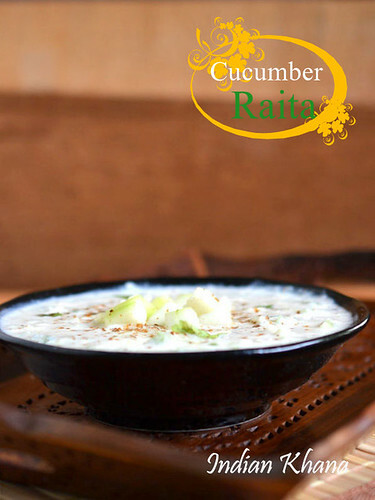 Cucumber raita is most popular raita or accompaniment made with yogurt, cucumber and seasoning. Wash and peel cucumber, cut half cucumber into small pieces and grate another half cucumber, finely chop green chilies, coriander leaves keep aside. In a bowl whisk curd well. With curd add grated and chopped cucumber (reserve little for garnishing), green chilies, coriander leaves, salt, roasted and crushed coriander seeds (if using), cumin powder and mix well to combine everything. Garnish with reserved chopped cucumber, cumin powder and serve immediately or keep in fridge until ready to serve. Serve Serve with any paratha, variety rice, biryani, pulao etc or during fasting serve with anything of your choice. You can also add 1/4 tsp of red chili powder if not making this while fasting. You can add fresh crushed pepper too for taste. Use fresh, thick curd for better tasting raita always. Adding coriander seeds is optional but that's add good taste to raita. Use sendha namak (rock salt) if making this raita during fasting and table or black salt during normal days. 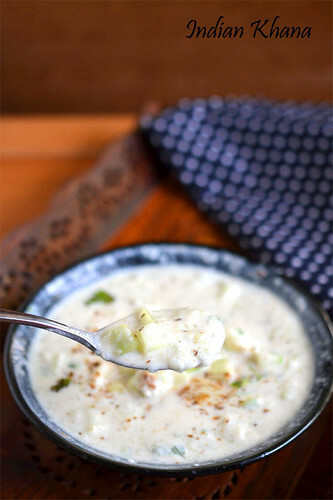 Quick and refreshing cucumber raita.